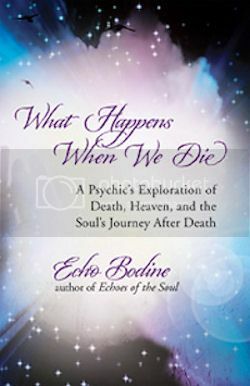 What Happens When We Die by Echo Bodine is a psychic’s exploration of death, heaven, and the soul’s journey after death. It provides the reader with a guide for your soul for insightful awareness on a topic that most people want to know more about. “With her signature wit and fearlessness, beloved psychic and healer Echo Bodine offers answers to life’s biggest questions: Is there a heaven? Are there people who have been there and come back? Do we have souls? Can we communicate with deceased loved ones? What Happens When We Die is a well written and very readable guide on the topic of life and death, and how we deal with it all. Although this is a topic that interests many people, it is not an easy one to talk about for most of us. This book is a most helpful tool in exploring the topic and really makes you think about it on a much deeper level than you may have previously been thinking about it. The topics in this text covers the soul, death, celebrating life, exit points, communicating about death, what it feels like to die, suicide, funerals, death of children, the white light, heaven, communicating with loved ones after death, and how to cope with the loss of loved ones. I really like how Echo Bodine added in tips on communicating with loved ones on the other side, and also cautions on how you shouldn’t do it all the time. This was perhaps my favorite section in the book, although I enjoyed reading it all. Echo Bodine is one of the best in this business, and her experience and wisdom in this field really shines through in this book. Her tips and suggestions and witty personality make this an excellent book that I definitely suggest for everyone to read. * Thank you to the publisher of What Happens When We Die, New World Library, for providing me with a copy of this book for review. All opinions expressed are my own.